Preheat oven to 200° C and line a baking tray with baking paper. In a food processor, mortar and pestle or with a knife, roughly chop cumin seeds. Add panko breadcrumbs, ground coriander and sesame seeds and mix. In a microwave-safe container with a lid (or a bowl with cling wrap) microwave the potatoes for 4 minutes on HIGH, stirring after 2 minutes. Toss with olive oil and pepper and scatter on an oven tray. Place in the oven while you prepare the chicken. Divide the yoghurt evenly into one big bowl and one small bowl. Set the small bowl aside to make the dressing. Slice the chicken breast in half so you get two, thinner pieces. Sprinkle the pieces with flour, and shake off the excess. 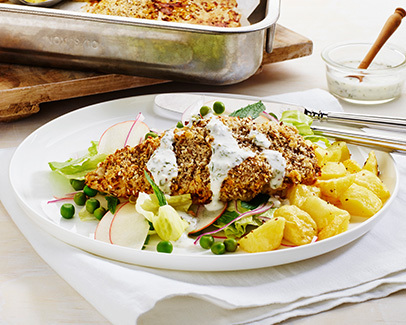 Dip the floured chicken in the yoghurt, shaking off excess and place on baking tray. Discard yoghurt that has touched the raw chicken. Press half the spicy crumb mixture on to the top of each chicken piece. Put the chicken on the oven tray next to the potatoes. Bake for 20 minutes, until the chicken is golden and crunchy and the potatoes are soft. Meanwhile, make the dressing by finely chopping half the mint and mixing with the reserved yoghurt and the lemon juice. Season with pepper. Assemble the salad by arranging the vegetables, apple and mint on a plate and topping with the chicken. Pour the dressing over just before serving.